New German / American reissue label 20th Century Music is set to release three long lost and out of print titles to make anyone’s upcoming holiday season better than expected. December 8th sees IDEFI, the material that should have made up Houston based progressive metallers DRIVE’s third album, finally hit the streets in a proper release. Working very closely with the band members and their families, IDEFI is not a reissue, rather, a celebration of singer David Earl Taylor and founder member / guitarist Rick Chavez, lives. The album features a huge 24 page booklet, liner notes from Chris Leibundgut, heartfelt tributes to both Chavez and Taylor and the first 100 orders will also include a Rick Chavez guitar pick replica. The album is limited to 500 copies. On December 15th, both ALISTAIR TERRY’s Yonge at Heart and LION’s Dangerous Attraction will be rolled out. TERRY’s Yonge at Heart (a reference to his favourite street in Toronto, Yonge Street) is a power pop / melodic rock slice of heaven and was recorded after the Pet Hate frontman’s former band had called it a day. The album features a deluxe 16 page booklet, lyrics, liner notes written by Rob Evans and is limited to 500 copies. LION’s highly sought after Dangerous Attraction is considered a hard rock masterpiece of the highest order by many fans of the genre. 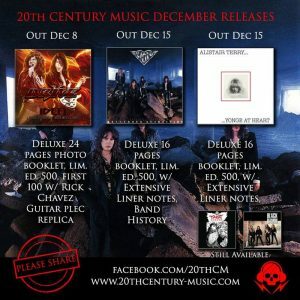 The album, the band’s first full length, was originally issued by Scotti Bros in 1987 and featured a reworking of their independent hit “Powerlove.” The remastered reissue also includes the “Transformers” theme song as well as a 16 page booklet, extensive liner notes detailing the band’s history written by Chris Leibundgut and is limited to 500 copies.